So it's only taken me 7 months to finally finish my wine rack. We had a busy fall with Mini DIY starting preschool and then all the illnesses that come along with preschool germs. If you remember, the wine rack was in pretty sad shape. Lots of dust, mildew, and some missing screws. Since it was only $10, I figured I could do something with it. After a good cleaning, repairing and sanding, I finally decided on a color: Valspar's Lake Country #5003-5C. I'm really loving all the aqua and turquoise that I'm seeing out in blogland these days. It's quite a stretch from my typical decorating style. A style that I'm slowly but surely changing. I grabbed a million paint chips and spent a good hour pouring over them in the Lowes paint department...like I do everytime I decide to paint something. I picked Lake Country on a whim and I love it! I painted one coat of Kilz primer and 2 coats of Lake Country on. I hit the edges and a few other places with the palm sander to distress it. After the paint had dried, I rubbed on a Valspar Antiquing Glaze all over. I think it toned down the paint color and gave it a nice rustic finish. 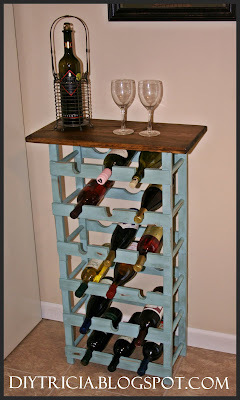 I didn't take any pictures of the painting and staining of the wine rack. I figure that is pretty self-explanatory. The top that Mr. DIY cut for me is stained with a couple coats of Minwax Special Walnut. I decided that it wasn't really dark enough for me so after the Special Walnut dried, I went back over it with a couple coats of Minwax Dark Walnut. So without further ado, here is my new wine rack.